The Compact Series of wind transmitters are designed for industrial applications such as building control, environmental monitoring and warning systems. 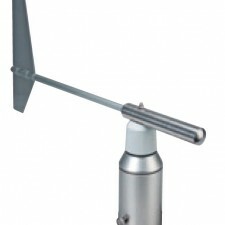 The Compact wind speed anemometer is a mechanical cup instrument designed for the measurement of the horizontal component of the wind speed with analogue output signals. Selected and tested materials ensure operation even under extreme conditions. The housings are made of seawater-resistant anodized aluminium and the cup is made of glass fibre reinforced plastic. For winter operation the instrument is equipped with electronically regulated heating which guarantees smooth running of the ball bearings and prevents the moving parts from icing-up.